Access Cowling visionaries Jen Hagmeier, left, and Amy Rees, unveil the donor recognition board at a ceremony for the all-inclusive playground Friday afternoon. It’s a playground Noah Hagmeier would have loved. In a perfect world he would be enjoying the brightly colored playground equipment at London’s Cowling Park with his older brothers, Fin and Jack. But now it is Noah’s spirit that touches the heart of every child who, like his brothers, will enjoy the fruits of a generous community. When Noah passed away needlessly a couple of years ago, his parents Jen and Dan wanted to keep the simple happiness of young children alive in the souls of the people of Madison County. They – along with many people who have generously donated their time and money – have done that through the realization of Access Cowling. The all-inclusive outdoor children’s activity center – appropriately named Noah’s Playground – had an official ribbon-cutting Friday afternoon which included a ceremony to honor the donors to the half-million dollar project. What started as a mother looking for an appropriate way to honor the memory a son became a project for all that captivated a community. When Jen Hagmeier linked with City of London’s Amy Rees, the dynamic duo became the visionaries not only of a traditional playground, but one that could be enjoyed by children of all abilities. Featuring wheelchair accessible equipment and many sensory items, the ever-growing project quickly gained monetary support. The inclusion aspect was an important one to Hagmeier, whose son Jack has some physical challenges. As she pointed out some of those who contributed to the project, Rees used it as a chance to highlight the positive impact this can have on others. “This project renewed my sense of community,” Rees said, pointing out individuals who helped on so many levels including Tony Shadwick of Penchura and State of Ohio Sen. Bob Hackett. 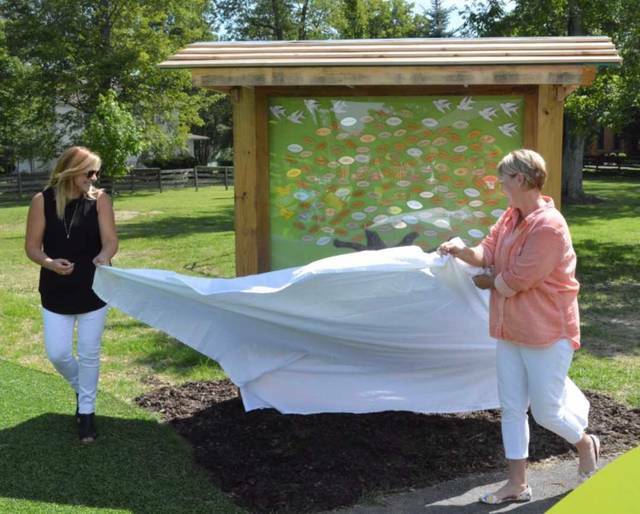 Hagmeier and Rees unveiled a large tree-shaped, glass-enclosed donation board – symbolically showing how many leaves were needed to fill out all of the branches necessary for success. Susan Thompson, Superintendent of Madison County Board of Developmental Disabilities, stressed the importance of both diversity and inclusion by giving value to every person, no matter what the differences may be. The Madison Press has been Madison County’s source of news since 1842 and publishes web updates daily and a digital newspaper each week.